Internet via satellite enables you to break free from internet problems and have a permanent two way connection to the Internet. Enjoy always-on, fast, satellite internet access whenever you need it – no issues with cable theft and phone lines. Save many hours delay downloading large files, surf the web, download e-mail. No more waiting for your connection. The service uses a small satellite dish at your premises connected to a modem to provide two-way access to the internet at speeds comparable to terrestrial broadband networks. The service operates independently of the terrestrial networks and can support multiple client computers at your location. 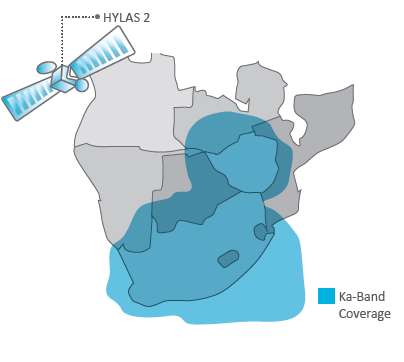 Why Ka Band: Ka Band provides a higher spectrum of available frequency. The satellite hardware is highly efficient thus resulting in a reduction in bandwidth costs and with the ability to deliver service profiles with a greater throughput and thus higher speeds. It makes use of spot beams to cover a region; these spot beams deliver higher power implying that smaller antennas can be used. Companies requiring highly reliable service. Rural locations, lodges, farms, mines etc. (where no broadband service is available). No Daily Data Usage Cap or Speed Limit. Free Zone: Usage between 23h00 to 05h00 is free. Data up/downloaded during this time is not deducted from your data cap. A 10% over run on caps is allowed. Speeds are then throttled to 64kbps for a further 10% and then hard locked. Top ups can be purchased at any time. Top ups are valid for 90 days. There is no free zone with top ups. Licensing costs are included at no extra cost (South Africa only). The satellite dish needs to have a clear view of the satellite.